Are you looking to add natural light to your home? How about improve your energy efficiency? If so, new skylights are a great option for you! Pro Home 1 installs quality skylights that will improve the lighting in your home and give your rooms a more open feel. We can provide you with the perfect skylight to fit your needs and match any room in your house. If you want to add a new skylight to your home, give us a call today at 1-844-801-2465 or click below to get started! We offer free estimates in Schaumburg, Wood Dale, Mount Prospect, and throughout the surrounding areas. 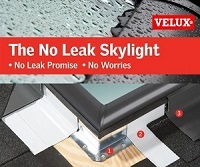 Velux has been an industry leader in skylights and roof windows for over 60 years, providing high quality, energy efficient options for homeowners around the world. While a skylight may seem like a simple addition, it can offer some great benefits to your home. Better lighting: A new skylight will increase the light flow into your room, allowing you to use less electricity. Add natural light: A skylight is a great way to bring natural light in a private room such as a bathroom or walk-in closet. More open feel: Skylights open up the ceiling to the outdoors, create an illusion of more space that can be very helpful in smaller rooms or areas with lower ceilings. Improved energy efficiency: Old skylights often have worn weather seals that allow air flow, causing you to waste money on utility costs. A new installation will solve these problems. If you want to install a skylight in your home, Pro Home 1 is here to help. We will help identify the best locations to get the most from the window, and we always work with the highest quality products available. Call us today to get started on skylight installation with a free estimate! We offer all our services in Wood Dale, Schaumburg, Mount Prospect, Palatine, Arlington Heights, Des Plaines, Elmhurst, Lombard , Naperville, Wheaton, and throughout the surrounding areas.